Vacuum forming/vacuum moulding is a plastic moulding process that involves heating sheet plastic into a three-dimensional component. Once the thermoplastic sheet (a type of plastic that can be reformed many times) is heated it begins to sag and at this time either a male or female tool pushes into the plastic creating a finished component. Vacuum is applied through the tool which draws out the excess air and in turn pulling the plastic sheet tightly around the tool and creating a component with great definition. 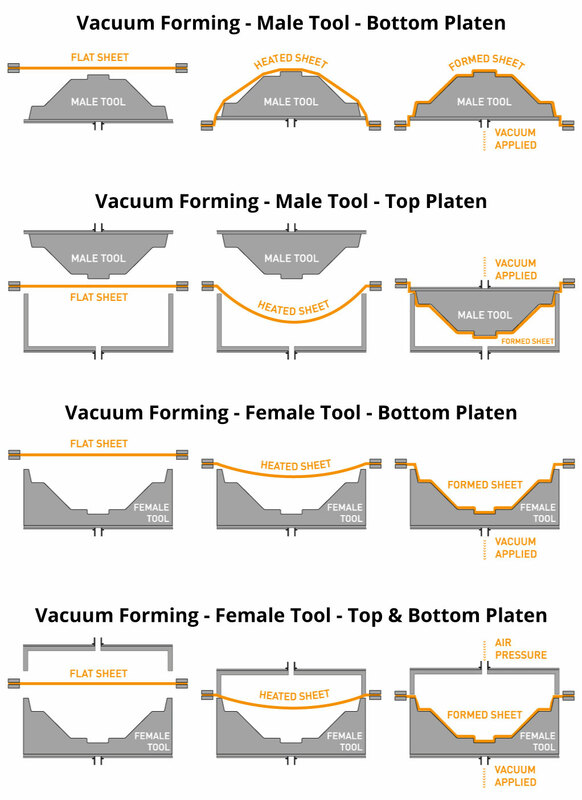 The terms vacuum forming and thermoforming are often used interchangeably. Vacuum forming is a beautiful way of creating plastic components especially for the Australian market. The greatest advantage of vacuum forming over other plastic moulding processes is the cheap tooling costs. Using timber patterns or epoxy resin tools, tooling can be created very quickly and cheaply as tools often don’t require CNC programming or complex aluminium tools. For small volume runs which is typical in Australia or jobs where you are unsure about your product commitments vacuum forming is a great way to get your product out there with low initial capital. Especially when producing large components this saving on tooling cost can be substantial. However vacuum forming is absolutely a high volume process as well as we can utilise aluminium tooling and multi-cavity tools than can produce many thousands of parts. Another unique advantage of vacuum forming is the ability to create pre-printed components. As the input to the machine is a plastic sheet we can actually print on this sheet and form the plastic which we call Distortion Printing. Using our advanced design and forming techniques we can predict how the print will distort when formed which means we can place your logo or design on your part which can look fantastic in point of sale situations or even backlit for gaming frames. Vacuum forming is a great replacement to fibreglass. 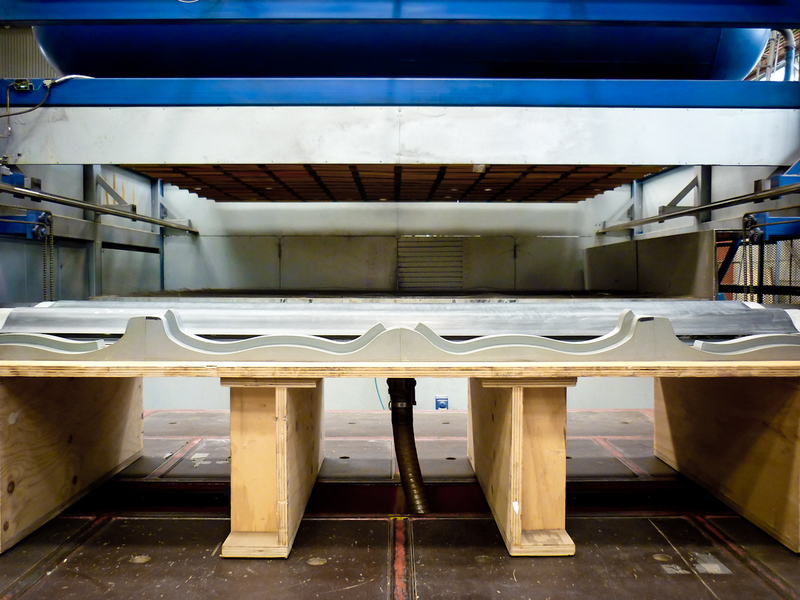 Vacuum forming has a low tool cost and components can be produced rapidly and more consistently. Using our ECP or Extreme Composite Plastic we can produce parts that are more durable, crack resistant, UV resistant, conductive and even 10-20% lighter than fibreglass. It is a no-brainer to explore Warringah Plastic’s ECP and vacuum forming combo to get higher quality and more affordable parts. All plastic waste produced in the vacuum forming process can be recycled to manufacture new plastic sheets making vacuum forming the sustainable plastic solution. Another key advantage of vacuum forming is you can create parts which have an ‘A class’ finish on the exterior surface. At Warringah Plastics we have multiple vacuum forming machines that are different sizes and serve different purposes. This enables us to run your project on the most economical machine which reduces cost and speeds up production times. We can vacuum form thin gauge material for thin walled packaging to thick gauge material for durable components like mud guards and dashboards. We have the capability of running timber/epoxy tools for small runs all the way up to complex aluminium tooling for running many thousands of parts. We can form parts as large as 3210mm x 2510mm! Warringah Plastics can also pressure form. Pressure forming is exactly the same as vacuum forming except in addition to having one tool that penetrates the sheet surface a second tool is utilised on the other side of the sheet which comes in and pushes air on the reverse side of the sheet. This forming technique can be used to create extremely crisp detail like lettering on logos without the need for injection moulding. We work with a whole range of materials that are well suited to a range of applications. This includes textured plastic which has a texture applied during the extrusion process which is fantastic for parts that wear over time and scuff resistance is important. We also have a range of innovative finishes like leather grain finishes for interior automotive components, wood grain colours and even mirror finishes. Warringah Plastics also has expertise in drape forming or drape moulding. Drape forming is a technique which just uses one male or positive mould which is heated to a high temperate and plastic sheet is place on it. After the sheet becomes molten, the sheet drapes or sinks into the mould under its own weight. An experienced operator can also apply pressure at particular points in the plastic sheet to create sharper definition into the final product. The benefit of drape forming is often the less expensive tooling cost because vacuum isn’t required. Drape forming is suitable for particular shapes like soft bends. Warringah Plastics are a market leader thermoformer/vacuum former with extensive industry, material and product experience. If you need to vac form your product, big or small, small to large volume we would love to discuss your project in more detail with you.